Picture taken from Henk of Holland website, used with permission. Here are some additional thoughts about the kit. First of all, let's look at what the kit aims to represent. It seems to want to be a very late version of the Panzer III Ausf. 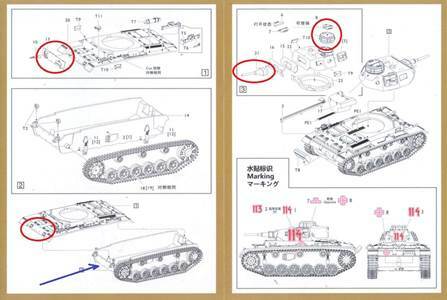 G, and late features (cupola, 5 cm gun, additional armor on front hull) are circled in red in the diagrams below. Actually, based on the feature marked by the blue arrow, one wonders if S-Model also wanted to make a version with bolt-on armor on the lower front. However, on the actual model the bolts are represented in the upper hull but not on the lower hull. The equidistant return rollers and the old-style sprocket severely constrains what the kit could represent in terms of later variants. In contrast, the extra armor presents constraints on how early the variant could be. Moreover, the desert vents impose further limits. Maybe my research skills are inferior, but I think the combination of features means that the kit could not represent any documented vehicle. Sure, there is tank 114 of 5. Pz.Rgt as seen in the decal. It seems that only the Ausf. H have the extra armor. As for 113, it is known to have the re-positioned rollers, so the kit could not represent vehicle 113 at all. 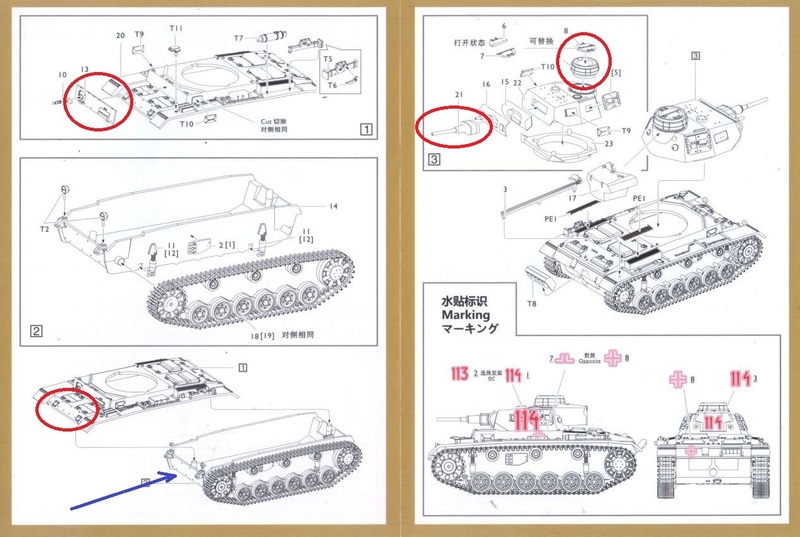 The reader may want to additionally note Robert Kru's observation (at the end of this review) that the kit is inaccurate because it has the driver's visor and cover for the starter crank at the back from an Ausf. E/F.